On Jan. 28, 1972, red-hot trumpeter Lee Morgan, finally drug-free after battling a debilitating heroin addiction, took to the stage of the groundbreaking PBS show Soul!, hosted by Washington, D.C., native Ellis B. Haizlip. Three weeks later, his common-law wife marched into an East Village club in New York City, called out Morgan's name as he stood onstage and shot the 33-year-old trumpeter directly in the heart. Morgan's appearance on the show, one of his last documented performances, would be included on his album We Remember You, a compilation of live performances. It remains a seminal performance by a seminal musician. Morgan was just one of many brilliant musicians featured on Soul!, the brainchild of Haizlip and producer Christopher Lukas. It filmed musicians like Morgan in ways that television hadn't dared to try before. Musicians were free to experiment live onstage, improvising, as if they were performing in nightclubs. Much of Melissa's challenge has involved a wild-goose chase to find existing episodes from the first season in 1968, many of which were taped over to save money and space for the station because, as she says, "In the beginning they didn't know what they had." There were many firsts on the show — such as the first time B.B. King and Roberta Flack ever appeared on television — and there have been many discoveries by Melissa, including an episode with a then-16-year-old Arsenio Hall performing magic tricks. The show had many powerful moments, including a two-part episode in which guest host Nikki Giovanni interviewed James Baldwin in London. Their conversation was later transcribed into a book, A Dialogue. The concept for the show was born five months after Martin Luther King Jr.'s assassination, in the wake of uprisings and the findings from the Kerner Commission, charged with investigating civil disorders that destroyed cities from 1964 to 1967. In the report, the media were criticized for sensationalizing the riots, not examining their causes and not reporting on them from an insider's view because of a lack of black representation. The report's findings: "Our nation is moving toward two societies, one black, one white — separate and unequal." The Kerner Commission inspired Lukas, who is white, to produce a special, Talking Black — an exploration of life in inner-city Boston, Pittsburgh and New York — to show that there was more to black life than the crime and poverty that was depicted on the nightly news. 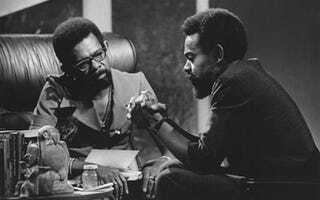 When the show received rave reviews, Lukas, who at the time was the director of cultural programming for WNET (then WDNT) in New York, approached Haizlip, the first black TV producer at the station, about creating a black arts show — a "black Tonight Show." Artists who weren't considered mainstream enough to be on The Tonight Show Starring Johnny Carson or The Ed Sullivan Show — Joe Tex, Amiri Baraka, Ron O'Neal — were given a platform to perform and to discuss their work and their views on social issues. Well-known artists like Miriam Makeba got airtime, too. There were stars in the making off camera, too. As a young director — one of the few blacks in the industry — Stan Lathan directed the series along with Ivan Curry. Lathan (father of Sanaa) would go on to direct Hill Street Blues, Miami Vice, Sanford and Son, The Waltons and Roc. "I remember eating oatmeal at midnight [as a child] with my uncle, and the guest stars he would bring home after taping the show," Melissa says. "I would bask in the glow of all of these intelligent, glamorous black people. It would be years before I would learn that it was James Earl Jones who had pinched my cheek, or the children of Malcolm X, whom Uncle Ellis was baby-sitting and brought over for a playdate." The show debuted on Sept. 8, 1968, and in the beginning it had occasional guest hosts, such as professor and author Dr. Alvin Poussaint and actress Loretta Long. Haizlip, who studied theater at Howard University, took the hosting reins a few weeks later. He became known for an interviewing style that mixed down-home colloquial speech with intellectual references; he had a knack for getting artists to open up about their inner workings. "What was great about Soul! is that the artists were totally free to express themselves without any censorship," says Swain. "One thing artists have gotten away from is using the medium to communicate exactly what they feel. Ali, Sidney Poitier, Harry Belafonte, said exactly what they felt. Who does that anymore? We should not have been shocked at Kanye's comment about George Bush. Soul! would have aired that and much more." And Soul! proved to be a hit. A 1968 Harris poll estimated that more than 65 percent of African-American households with access to the show watched it on a regular basis. In the early 1970s, prisoners in Atlanta purportedly staged a sit-down strike until they were allowed to stay up late enough to watch the show. At the time, Haizlip said that that one day the show "will be included in the television history of this decade when things go down." Before Ashford's death last month, the documentary filmed the singer and his wife in their Manhattan restaurant, the Sugar Bar. During the interview they sat side by side, reminiscing about their time on Soul! "I was so nervous," Simpson said. "It was our first time on television. We hadn't recorded an album together yet. [Haizlip] foresaw something that was about to be — something we didn't see in ourselves. After the show, so many people wrote in and said that we should be a duet. The thought had never entered my mind." By 1973, Haizlip sensed that the end was drawing near for the show. There were rumblings that shows in some markets weren't being aired or were being aired late at night, when no one could see them. Funders were asking if he could "integrate" the show. Haizlip's reponse? "We're integrating the network." The network executives pulled the plug and said they were replacing it with a more integrated show, Interface, but the money eventually ended up going toward developing the pioneering newsmagazine The MacNeil/Lehrer Report. When the show was canceled, there were protests from the Urban League, the Congressional Black Caucus and the National Newspaper Publishers Association, the D.C.-based federation of black newspapers. Haizlip received more than 100,000 letters of support. On the last show in 1973, Haizlip — unflappable, talking in subdued tones, with his neatly tapered Afro, reading glasses and buttoned-up brown suede butterfly-collared jacket — declared that Soul! was only the beginning of "the route of documenting our own history." Melissa Haizlip said that she hopes her documentary will inspire black youths to get to know their own history at a time when they are saddled with an overabundance of reality-television programming and few alternatives that instill a sense of black cultural pride and consciousness. "We don't express ourselves openly anymore," said Democratic Rep. Maxine Waters at a screening of Mr. Soul! in Los Angeles. "It's not politically correct to do so. I just have visions that a movie like this will inspire young people. They have to see this so they can begin to understand that there is power in telling the truth." Ericka Blount Danois is a music-and-culture writer and professor at the University of Maryland's Medill College of Journalism. Her work has appeared in publications including the New York Times, Sports Illustrated, Wax Poetics and Vibe.